In this article, I will show you an example of AlertDialog. We will show an alert dialog when we want the user to make a decision. 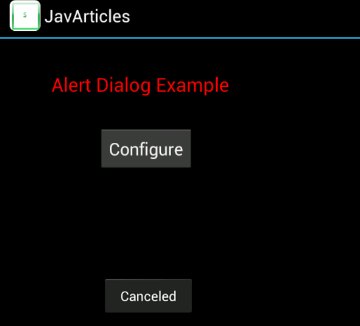 AlertDialog is the class that represents an alert dialog. To build it, you need to use AlertDialog.Builder. Let’s create a simple alert dialog and show it once user clicks on a button. Create an instance of AlertDialog.Builder. Configure the dialog using the builder instance. Set the dialog attributes like title, message, icon. For example, to set title call setTitle. 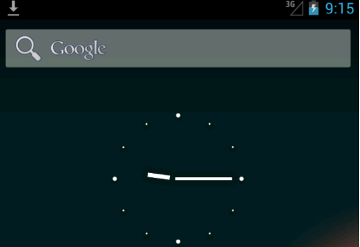 Add the action buttons which will define the action to take when the user presses the button. Main layout consists of a text field and a button. When the button is clicked, we want to show the alert dialog. Use an instance of AlertDialog.Builder to build the AlertDialog. 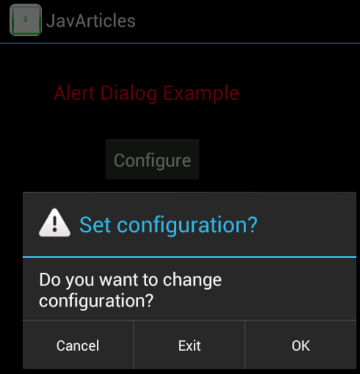 Call AlertDialogBuilder.create() to create AlertDialog. Call AlertDialog.show() to display the alert dialog. To add action buttons Ok and Cancel, call the setPositiveButton() and setNegativeButton() methods. Pass an instance of DialogInterface.OnClickListener to define the action to be performed when user presses the button. In our example, when user presses ‘Ok’, we want to open another screen. When ‘Cancel’ is pressed, we will simply display a message. Use neutral when you want to proceed with an action which is neither positive nor negative buttons. In our case, when the neutral button ‘Exist’ is pressed, we will finish with our activity. Click on Cancel to close the alert. Click on Ok to navigate to Configuration screen. Click on Exist to finish with the activity.